During my parents extended stay away from home, our LPG gas connection was automatically blocked after six months of no activity. I didn't know how to get it unblocked. As per the instruction received from friends and family members, I went to the nearest Gas Distributor in Hanur - a small town - with a request to unblock the gas connection. Distributor directed me to fill up a request form and submit it along with a copy of Adhaar card (Indian ID card) and inquire within a week's time. After my home return, friends shared and suggested that I should have paid 100 Indian rupees as a bribe. If I did, the connection would have been unblocked by the distributor right away. As an individual, I am very uncomfortable with paying bribes or money to get things done quickly. I also feel very uneasy to ask for preferential treatment. Nonetheless, since my parents were not feeling well, I looked for ways to get our gas connection unblocked. I learned that I need to sneak 100 rupees note in the gas booklet and handover to the distributor. This is how things are suppose to get done quickly in India. Looming over this uncomfortable things-to-do, I thought about how this bribe-paying first started. Setting aside the local Indian population, I am very familiar with this common behavior of many Tibetans i.e., to pay money to get things done quickly. Initially, some rich guys pay and later, everyone has to pay. It has become a common practice, accepted and unquestioned by all. I believe this is how the story of 100 rupees started - most probably by our own Tibetan people. Coming back to my problem, even after two weeks, the gas connection was still blocked. I sensed that it was not unblocked as I failed to pay 100 rupees during my first visit. Due to the lack of available options, I researched alternative ways to get my gas connection unblocked. Despite the poor Internet connection, I managed to find Website of the gas company and created "My LPG" account. Through this account, I wrote a customer complaint on the slow unblocking process and how 100 rupees work with this distributor. To my surprise, within a day, I got an email response from the customer service. I also downloaded the gas company mobile app which provides a lot of useful information including the gas connection status. The connection was still blocked. On the very next day, I called customer service center and registered another complaint via phone call. Please remember that you will be given a reference number for each complaints you register. Since the connection was still blocked the day after, I went to the distributor for the second time. As I reached the entrance of distributor's office, they already know me. I felt good that my two complaints has done some damages. 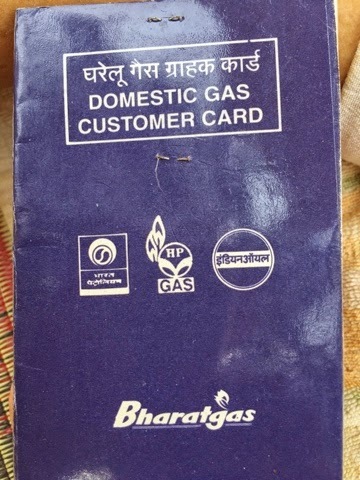 When I handed over the gas booklet to one of the lady employee, she asked, "who told you that we take 100 rupees to unblock the connection?" With some sign of anger and frustration, I asked her in English, "Why my gas connection is still blocked. It's been two weeks." I then dialed the customer service center and registered another complaint in front of all employees. The customer service agent also talked directly over the phone to the manager/owner. I also sensed that all employees were getting nervous because of my repeated complaints. I don't know what the customer service agent said to the manager/owner but things started to fall in place. I felt I was in control of my rights to get the gas connection unblocked. The manager/owner showed their Unblock Register and explained how unblocking process works. He also gave assurance that I don't have to come to their office again. He wrote down my cell number and told his employee to call once my connection is unblocked by the sales representative from another office. He even shared the name and cell number of the delivery guy so that I could get a gas cylinder refilled even with the blocked connection. I left their office smiling and saying thank you to everyone. While riding home, I realized that India is changing; and technology is helping India change. Most importantly, if you are willing, you can be the Change Agent to bring change in your own community. Saving 100 rupees was less significant than discouraging the ill practice of paying money to get things done quickly or to seek preferential treatment. At last, in India, the strategy to succeed in an argument is showing some display of anger and little bit of English. I was suggested by my mates to use the best Vietnam visa service and it was the best service I've used. If you need to know that service, Click here and you'll be taken to the service. What is happening with RTYC NYNJ?